Caladiums are tuberous tropical perennials grown for their leaves. There are hundreds of varieties of caladiums. The caladium does not flower but instead produces leaves which are strikingly colorful, beautifully shaped and heavily patterned in reds, pinks or whites with little green color left. 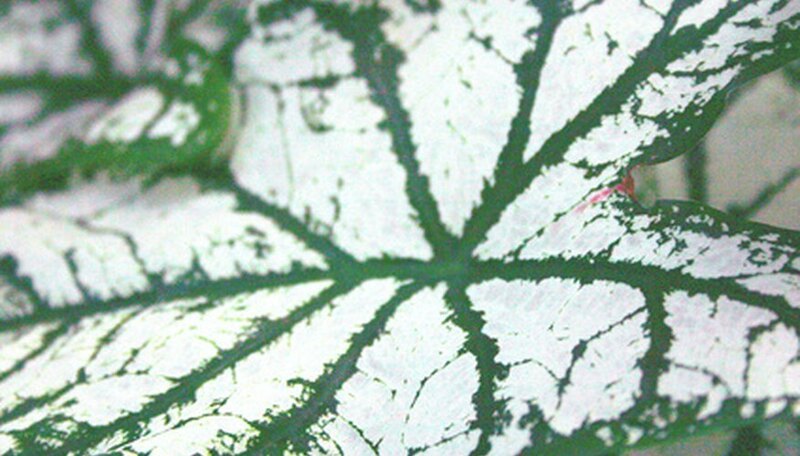 The two most common types of caladium, fancy leaf and lance leaf, are distinguished by their leaf growth characteristics. Caladium plants can be bought at local garden centers or started directly from tubers if planted after the danger of the last frost of the season. 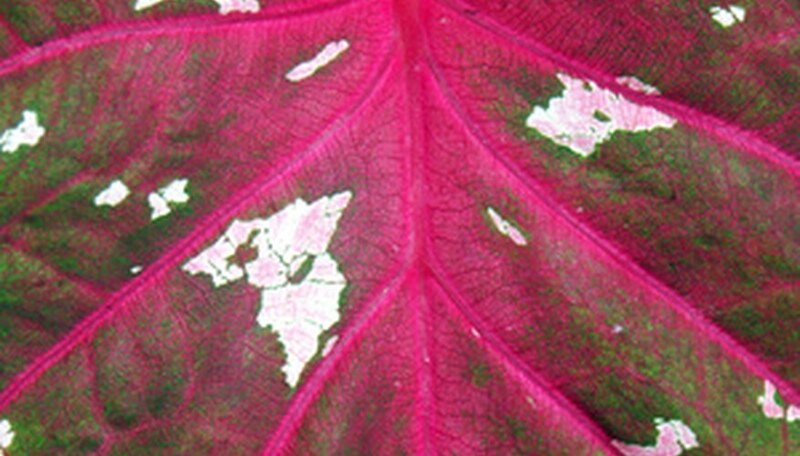 The fancy leaf caladium is used in landscapes. They have big heart-shaped leaves in splotches of pink, red, white and green. Other varieties have solid red or white leaves with dark green trim along the edges. This 1-foot tall plant is a favorite over most other ground covers. They add unprecedented color with their dazzling leaves, texture, and blend well with other plants in the landscape. The postman joyner is a cultivar of the fancy leaf caladium. Their leaves are green with a bright red center, including the veins. They don’t do well in cool-soil temperatures, which can promote root rot. 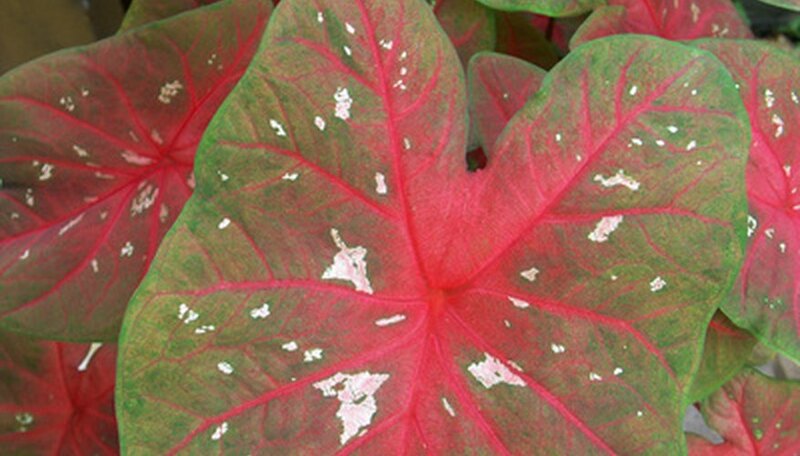 The large fancy leaf caladiums cannot be exposed to full sun as this can cause burn. Rosebud is another cultivar of the fancy leaf caladium. Their leaves have a rose color pink backdrop that fade to white and then to a green at the edges. Rosebud is a favorite for their prettily colored arrow-shaped leaves. They make great border plants or container plants. The main physical difference between the lance leaf type and the fancy leaf is where the stem meets the leaf. The fancy caladium's stem is situated more toward the center. The lance has a stem that meets nearer the edge. Lance caladiums are smaller and more densely compacted. They have the colorful, beautifully shaped and heavily patterned leaves as well. They are a bit more sun tolerant and due to their smaller size make great container garden plants that blend well with a number of other plants including cannas. Clarice is a popular choice among the lance leaf caladiums. They have pale cream to pink leaves speckled with red. They are usually an excellent bedding variety for shade and partial shade but this particular cultivar performs well in full sun.